Chef Chris Calhoun is Director of Food and Beverage and Executive Chef. Chris comes to the role with a wealth of experience and a passion for food. Like many future chefs, he started cooking as a part time job while in high school. The Chadds Ford Tavern’s Chef Mark Speena recognized his interest and took him under his wing, laying the foundation for Chris’ professional development. After graduating from the Culinary Institute of America, he apprenticed under Michelin star and James Beard award winning Chef, Gunter Seeger. 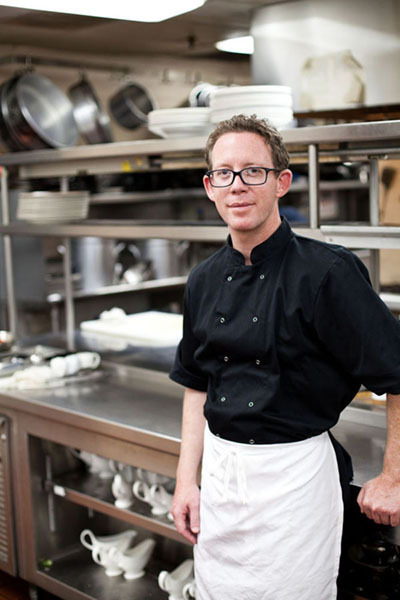 Chris worked for Chef Seeger for six years, eventually becoming his executive sous chef. He oversaw the menu at the acclaimed “Seegers” which was notable because the menu was created daily based on the freshest, locally sourced ingredients. From there he took the Executive Chef position at Orchids at The Palm Court in the Netherlands Plaza Hotel in Cincinnati. Within the first year, he had taken the once forgotten restaurant to being named one of the Top 25 in Cincinnati Magazine and earned the coveted “Dish of the Year” title. Chris returned to the area in 2012 to take over The Desmond food and beverage operation. In his first six months in the area, he completely re-designed the menu and once again earned “Dish of the Year” honors, this time at the annual Philly Cooks event. Chris and his talented culinary team conceive and execute the menus for each of our three restaurants plus the Desmond banquet facilities. In addition to The Fork & Bottle, Fox & Hounds Pub and The Sunset Grille deck, the hotel handles a full schedule of weddings and corporate events throughout the year and has built a sterling reputation for excellence based on the quality of food and service. Read more about Chef Chris Calhoun here and here.